Cows say moo. But what sounds do other animals make? Children and adults alike have long been delighted by the amazing detail of Graeme Base’s artwork, along with his stories in books such as Sign of the Seahorse and Animalia. Now, though, the very young are being offered a series of fold-out flap books, the Little Bug Books. Cows Say Moo , one of the four titles, focuses on the sounds made by animals including cows, ducks, tigers and more. Each spread includes minimal text. 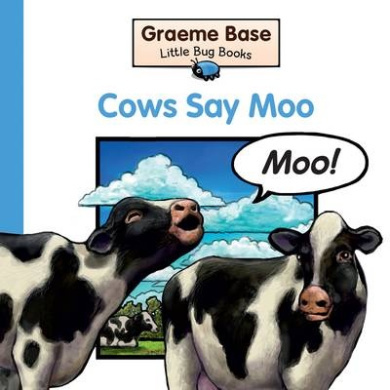 For example, the cows spread features the words ‘Cows say’, and when the flap is folded out, a speech bubble shows one of the cows ‘saying’ Moo!. The illustrations use white space, with realistic looking animals against rural backgrounds, simpler than the complex illustrations of Base’s longer works. Hidden in each illustration is a little bug, providing a challenge for slightly older readers. This sturdy offering, and the remainder of the series, will be loved by young readers.